when the seasons change, it takes a moment for the eyes to adjust to the new colours in nature. after the glare of the long, hazy summer, autumn is a gentle delight of rusty reds, frazzled oranges, muted sage and moss. its a foragers dream out there; the hardy foliage is a gift of nature and what better way to celebrate than by making an autumn wreath. 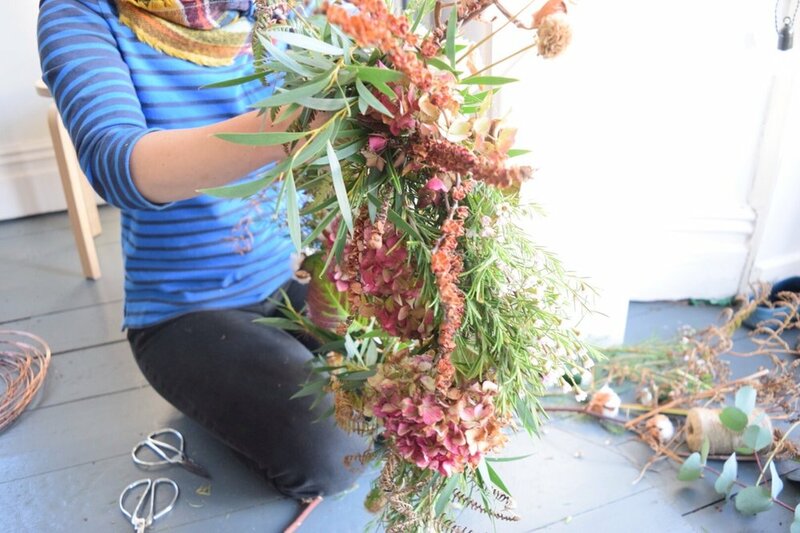 I popped in on my dearest friend and neighbour, florist Rebecca at Ivy, Pip & Rose, to capture her in the process of crafting a seasonal wreath and we have put together a guide to help you create your very own autumnal design. think about the kind of wreath you’d like to make. If you are drawn to a loose, wilder style, look for interesting shapes and a variety of textures. For a more formal look, you could limit the palette or the flowers that you choose to include in your wreath. Try out a few different ideas and have a picture in front of you as you are creating to help you guide the arrangement of what you have in mind. a little bit of space to make your wreath. the floor is ideal! start by looping the green bind wire over and over the wreath frame so that it feels secure and won’t slip. add your backing foliage. depending on how loose you would like your wreath to look, you could make this backing quite open with spaces or quite dense and full. think about the flow of the leaves; do you want them going in the same or different directions? wrap the bind wire around the foliage to hold it in place. check it’s secure. don’t worry too much about cutting the stems, you can tidy it all up at the end and some stems look rather nice left uncut. Add your next layers. think about the different textures you have collected and what might look interesting. you may want to cluster some blooms together for more impact. a loose wreath will look better if there are curves and twists, so use the natural shape of the foliage or flower and the overall shape will be more organic. try not to be too sequential (hydrangea then eucalyptus then roses then hydrangeas then eucalyptus then roses … for example!). have fun experimenting with different combinations and secure with the bind wire when you are happy with how it looks. 6. keep checking the shape - lift up your wreath regularly to see how the design is evolving. do you like the colours that are next to each other? could you add in a few more flowers? what is catching your eye? 7. when you are happy with your wreath, double check that everything is tied securely in place. 8. using the twine, make a loop at the top of your wreath so that you can hang it, if that’s what you’d like to do. Have a look at the back of your creation too - it will be almost as pretty as the front! Now stand back and admire your autumn wreath! We would love to see your creations - send us your pictures or tag us on instagram. Follow Rebecca on Instagram @ivypipandrose and on Pinterest, Ivy, Pip & Rose.